Avant-garde office chair brand noblechairs raises the bar up high by bringing you its impressive EPIC series swivel chairs pioneering the world's first gaming chair featuring valuable and exceedingly durable real leather covering. Their equally well-equipped faux leather siblings are made of 100% vegan polyurethane (PU) with similarly outstanding characteristics and a 25 per cent higher material thickness of 1.5 millimetres. This unique SK Gaming Edition in black-white-blue has been made especially for fans of the SK Gaming eSports team and thus features the famous clan's own branding. It comes with blue seams along with a white logo patch with black-blue embroidery and its easy-to-clean black artificial leather is nicely framed by white faux leather stripes. The entire range of noblechairs' classy gamer seats shares the same stellar German design that strikes a perfect balance between luxury car-inspired appearance and materials as well as idiosyncratic gamer chair styling and ergonomics descended from racing car seats. The resulting discreet design without garish colouring creates an air of noblesse and renders the noblechairs gaming chairs simply beautiful. The chairs' elegance is furthered by many loving details like the white debossed SK Gaming logo that crests the headrest above an elliptical noblechairs aluminium emblem with relief lettering which adorns the backrest. The rear of this special edition also features white SK Gaming logos on the headrest and backrest. 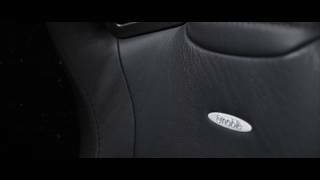 The breathable imitation leather cover possesses an intriguing surface texture that emulates real leather perfectly and is embroidered with a gorgeous diamond pattern stitching. More links for "EPIC Gaming Chair - SK Gaming Edition"
After many years of having a "normal" directors chair, but of the budget quality, I eagerly looked forward to receiving my first proper gaming/computer chair. Great decision. Arrived in Ireland from the UK after just 4 working days of my order. Perfectly packaged and no damage during shipping and handling by at least 4 different couriers. It was exactly as advertised although 1 of the holding screws to the under of the arm rest which was already installed was cross threaded and therefore not seated correctly, but as it was out of sight and appeared firm I did not make a drama of it. I was just a little bewildered as the enclosed instructions say it is for user weights of 100kg max., but the Overclocker site say 180kg. However, I am writing this sitting on the chair and all is well. Great product, very pleased with this classy chair. Relatively easy to put together, extremely comfortable and very adjustable. Looks great too and most importantly the back is high enough that I can lean back and rest my head despite being tall. 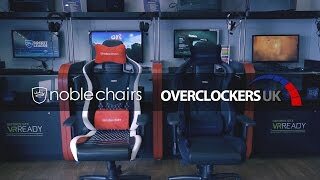 I brought one of these after my old gaming chair finally gave out on me. During unboxing I found all parts individually wrapped and secure in place in the box. The actual chair oozed quality in my opinion. The leatheres although is faux. Looks real enough and the stitching is top notch. After assembly I found that the chair has a lot of customisation. Apart from the normal up and down and the whole chair reclining. It has themerged ability to recline the backrest. Pretty much like a car seat. The high headrest is a nice touch with the added head cushion. There is also a lumbar cushion for support in the lower back. The armrests go up and down, there's the ability to move them further in or out from the centre. My only grumble is the seat is stiff and after a few months it's still rock hard. a solid chair for the avid gamer. Lots of adjustable comfort options. Don't be put off by the price tag. You get what you pay for. Just received my Epic Gaming chair from Noble Chairs. Very happy with it, had been sitting on the fence about gaming chairs for the last few months and so happy i finally pulled the trigger. Seat was very easy to put together, and appears to be very well built. A little on the firm side but will soften up over time. Tested the full leather version at overclockers which was a dream, but the price put me off, however this is just as good. 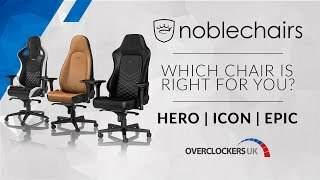 The EPIC series from noblechairs ticked all the boxes for me and if you are in the market for a new chair, this should definitely be on your short list!